On this day in 1982, the government informed the residents of Times Beach, Missouri that they would have to evacuate. 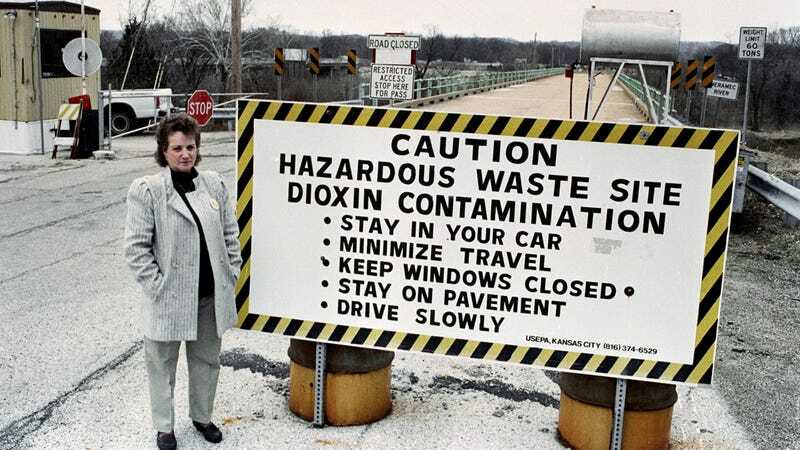 The town had paved its own roads with dioxin, among the most toxic cancer-causing substances made by man. So what kind of town was Times Beach, and how did it end up paving its roads in dioxin? In an article published today, History explains that Times Beach was a small community that sprung up on a newspaper promotion in 1925 offering cheap land on the banks of the Meramec River with the purchase of a subscription to the St. Louis Times-Ledger. The town never quite blossomed as it was promised, but it ended up with over 2,000 residents. In 1972, the town didn't have the funds to properly pave their dusty dirt roads, so they struck up a deal with local waste hauler Russell Bliss to glue the dust to the ground with motor oil at a cost of six cents a gallon. Russell Bliss was confident that his motor oil technique would work because he'd used it at nearby stables and around his own home before that, as Robert Emmet Hernan writes in This Borrowed Earth: Lessons from the Fifteen Worst Environmental Disasters around the World. Bliss's oil was free for him, since he had mixed one tankload of it with six truckloads of waste material from a chemical manufacturer, which had paid him to get rid of their waste. This chemical manufacturer made its money manufacturing Agent Orange during the Vietnam War. Their waste turned out to be hexachlorophene tainted with dioxin, a kind of toxin dubbed "the most potent cancer-causing agent made by man," by a paper in the following years. History notes, most tragically, that kids loved to play in Bliss' purple goop and it was years before anyone started to get sick or suspect that something was wrong with what the road crews were spreading all over town. The first casualties were 62 horses that died in 1971 in stables that had been sprayed with Bliss' mixture. Bliss claimed he'd only used motor oil, but local officials got the EPA to start an investigation anyway, St. Louis Magazine reports. By 1979, the EPA had identified where Bliss got his waste, and they also found that the company had been disposing of dioxin. It was that year that the EPA came around to Times Beach, started testing its ground, and found dioxin. In 1982, the EPA announced its findings that dioxin levels in Times Beach were off the charts. Panic hit the town, and then the nationwide papers. President Reagan formed a dioxin task force and over the next three years the government bought up the whole town (save for one stubborn elderly couple who refused to sell) and evacuated everyone. In 1996 and 1997, the government gathered and finally incinerated 240,000 tons of the toxic dirt. The whole cleanup cost the EPA $250 million. Times Beach remains the largest civilian exposure to dioxin in the US and one of its strangest stories of localized environmental disasters we've ever had.